Benjamin Bolger approaches his education the way some people approach a buffet at a restaurant: why settle for one dish when you can get some of everything? 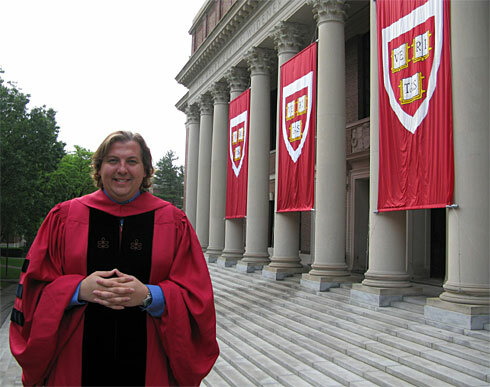 Bolger, 32, donned a cap and gown at Harvard University on June 5th to receive his 11th graduate degree, and his first doctorate. A 1994 graduate of the University of Michigan, Bolger's studies range from general liberal arts to more specialized fields such as real estate. He has received degrees from Columbia, Harvard, Brown and Dartmouth and is currently studying at two more Ivy League schools, Penn and Cornell. And even with 11 degrees under his belt, Bolger is working on an additional five. Neither the Guinness Book of World Records, the Council of Graduate Schools nor the American Council on Education keep track of degrees earned in higher education, and none could verify if Bolger has set a record for most degrees. Still, none had ever heard of anyone earning more than him. What makes his achievements even more "extraordinary," says Kay Howell, one of Bolger's early tutors, is that he has severe dyslexia. About 15% to 20% of the population has dyslexia, which affects the way people perceive and process words, says Howell, director of the Michigan Dyslexia Institute. She says dyslexia is not a problem of intelligence, but those affected need to be taught to read and write in a different way than their peers, and don't always get that help. Bolger says he reads at an elementary school level. He has gotten through much of his education with the help of his mother, Loretta Bolger, who reads books out loud to him and types papers he dictates. He also uses books on tape and has learned to skim books very effectively. "Before I read a book, I … carefully study the structure and how it's organized," he says. His mother was also his teacher in his early years. When the family was unable to find a school that could meet his needs, his mother began homeschooling him. Bolger recalls trips to battle sites to study the Civil War and museums to study art. "I think the quality of Benjamin's life today was much richer because we took an active part," says Loretta Bolger. At age 12, Bolger enrolled in a local community college to supplement his homeschooling. He eventually transferred to the University of Michigan, where he graduated at age 19 and was a White House press intern for a year, fielding reporters' requests and distributing press releases. He says went in extra early if he had reading to do. After the internship, he enrolled at Yale Law School. But the techniques he had developed weren't enough to help him keep up with the extensive reading — he was failing. "My learning disabilities got the best of me," he says. After a year of improving his reading skills, he took another shot at graduate school, earning a masters in sociology at Oxford. He had the opportunity to begin both a doctorate at Oxford and a masters in philosophy at Cambridge. "Instead of picking between them, I decided to do them both," he says. He never finished the doctorate, but he went on to earn a slew of additional degrees at Cambridge, Stanford, Columbia, Harvard, Brown, Dartmouth, Brandeis and Skidmore. He says he works to raise awareness about dyslexia and inspire others to realize they can be successful in academia. Along the way he helped finance his degrees by teaching. For him, teaching is just another learning experience. He says would often teach for 10 hours a day and devote another eight to 10 hours to his own studies, leaving little time for sleep. Barry Burden, a University of Wisconsin professor who had Bolger as a teaching fellow at Harvard, lauds his communication skills with students. Despite Bolger's hectic schedule, he never let the stress show. People would "rarely … see a crack in that veneer," Burden says. Bolger is beginning a teaching position at the College of William and Mary this August — and plans to take classes in its graduate school of education.